Frances’ life began on January 8, 1923, the daughter of William Joseph and Ettie Mae (Hornbarger) Dunn in Peabody, Kansas. She attended school in Tazewell, Virginia and married Oscar “Odell” Reynolds on December 10, 1947, in Tazewell, Virginia. In her early years she worked for Boeing and later cleaned homes and provided laundry services for folks up until about 8 years ago. 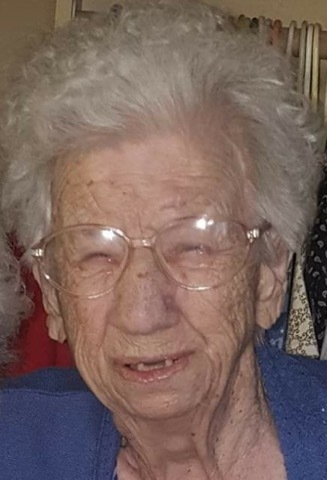 Frances was a member of the Nazarene Church, enjoyed women’s circle at church, needlepoint, ironing, playing and calling bingo, reading, traveling to see family and senior bus trips. She had a wonderful ministry sending out cards for birthdays, anniversaries, get well and sympathy cards to the elderly that were shut-in. Her loving family includes her nieces, Salina Stewart of Willcox, Arizona, Mildred Laffoon of Leon, Iowa and Judy Richie of El Dorado; sister-in-law, Rose Reynolds of Hagerstown, Maryland and many great nieces and nephews. She was preceded in death by her parents; husband; brothers, Jasper, William and Eugene Dunn; sisters, Beatrice Hill, Thelma Stovall and an infant sister, Ollie Mae Dunn. Frances passed away peacefully on Friday, January 11, 2019, having reached the age of 96 years old. Her family will gather with friends on Thursday, January 17, from 5-7 pm at Carlson Colonial Funeral Home. Graveside services will be held Friday, January 18, at 10:30 a.m. at Sunset Lawns Cemetery with Pastor Debbie McClure officiating. If inclement weather, services will be held at the funeral home. Memorial contributions in her name may be directed to The First Church of the Nazarene, 202 N. Taylor, El Dorado, Kansas 67042. Please sign her online guest book and leave a memory of Frances at www.carlsoncolonial.com.